Seminar presented by Dr. Ana Mijc, Associate Professor in Systems Water Management at the Imperial College London. An integrated approach to water use and protection, which accounts explicitly for trade-offs between human and environmental needs and services, is required to achieve sustainable development. This creates intricate links between three systems – human, technical and environmental – coupled in a dynamic system-of-systems with component interactions and feedbacks. However, governance systems are often ill-equipped to handle this complexity, which is exacerbated by rising demand, growing infrastructure interdependences, environmental challenges, continued urbanisation, climate variability and natural disasters. This highlights a major challenge that society faces – the need to take a holistic approach to water environment management, while accounting for the natural capital within the system. This talk will introduce a systems water management framework that takes into account technical components (infrastructure) that interact with each other and the environment (water and land), as well as multiple stakeholders that act in the system across different management scales including (at least) national, catchment and local, and which hold different perspectives on and priorities for the system. The framework can be used to define the components of the system, relationships between them, and a shared meta-model that integrates these components. This enables the complexity to be communicated to, and understood by the stakeholders, so that they can develop a shared purpose and collective strategy for integrated water management, and engage in plan designs for improved water system operation. Ana is a Senior Lecturer (Associate Professor) in Systems Water Management at Imperial College London, with expertise in advanced modelling and analysis of processes, planning, resilience and economics of water systems. Ana has a first class degree in Civil Engineering from the University of Belgrade, Serbia. She obtained a masters degree with distinction in Hydrology for Environmental Management from Imperial College London in 2009 and a PhD in Earth Science and Engineering from the same university in 2013. Ana is leading the IAHS Panta Rhei programme Working Group on Energy and Food Impacts on Water. 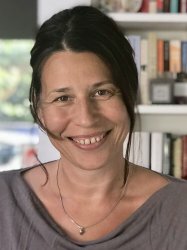 Her research is focused on development of novel systems analysis approaches and methodologies to inform policy, regulatory bodies and industry about the role and value of people, cities, natural capital and technological innovations in defining water security and sustainable development under future uncertainties. Her research themes include: whole-water system modelling, integration of innovative and sustainable solutions, water management under uncertainties and water market role in the sustainable water future. Ana is currently leading the UK-India 3-years project on Coupled Human and Natural Systems Environment for water management under uncertainty in the Indo-Gangetic Plain and 5-year programme on Community Water Management for a Liveable London.